Just Jingle: Let them eat Cake...and other such whimsies! Have you SEEN the new collage sheets over at Retro Cafe Art Gallery? Holy FUN, BATMAN!!! 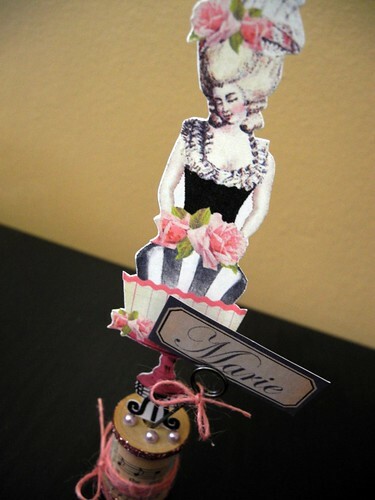 They are designed by Cassandra Vancuren and they are fabulous!!! I got to play with a couple of them and couldn't resist diving into the Marie Antoinette sheet and the ABSOLUTELY adorable borders sheet! I created a little Spoolie!!! I wrapped one of the borders from the collage sheet around the spool, added some May Arts burlap string in PINK! YAY! 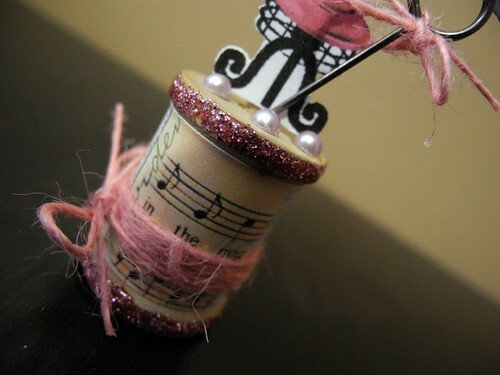 and accented it with glitter glue and pearls! AND...you can WIN one of the new digital collage sheets! Just hop on over to the blog and comment with your favorite! There are Alice sheets, Marie sheets, pretty sheets, cute sheets, word sheets...I could go on and on! HA! Also, while you are there, check out the awesome Valentine's Day Contest! And...there are more giveaways, so just keep your eyes peeled! I think there's still a lot of people that are out of touch in her way - scary! And, she may be a horrid person, but you know, her fashion was pretty awesome :) Love this -I don't know that I've ever seen a Spoolie before, but now I want to make one! Evil woman.....not YOU....Marie!!! Have to admit though...she sure does make a pretty spoolie. Great job, as always. Do you have any idea how much I love this?!!!! Mmmmmm, cake......Oh, wait. Love this spoolie!!! Too fab!! I had to come on just to see what a SPOOLIE was. So cool--just love it!! LOVE your spoolie! How cool is that? LOVE this! Such wonderful mix of elements! You are so creative! - WOW!! Oooh lah lah! 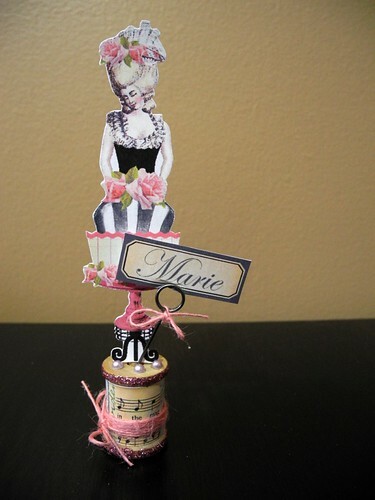 I'm loving your Marie, especially that awesome little pedestal. Serious eye candy, Jingle! gorgeous! this looks like a lot of fun to make! Eke! She's ab fab! She'd make an awesome cake TOPPER! But now I want cake . . . I love that you call it a spoolie! It totally rocks! And didn't she find herself at the guillitine? Oh well! Thanks for the inspiration! Oh I love her, shes precious!! !